Africa Addio (also known as Africa Blood and Guts in the United States and Farewell Africa in the United Kingdom) is a 1966 Italian mondo documentary film co-directed, co-edited and co-written by Gualtiero Jacopetti and Franco Prosperi with music by Riz Ortolani. The film is about the end of the colonial era in Africa. The film was shot over a period of three years by Jacopetti and Prosperi, who had gained fame (along with co-director Paolo Cavara) as the directors of Mondo Cane in 1962. This film ensured the viability of the so-called Mondo film genre, a cycle of "shockumentaries"- documentaries featuring sensational topics, a description which largely characterizes Africa Addio. The film includes footage of the Zanzibar revolution, which included the massacre of 1964, which claimed the lives of approximately 5,000 Arabs (estimates range up to 20,000 in the aftermath), as well as of the aftermath of the Mau Mau Uprising in Kenya. Prior to the film's release, allegations that a scene depicting the execution of a Congolese Simba Rebel had been staged for the camera resulted in co-director Gualtiero Jacopetti's arrest on charges of murder. The film's footage was seized by police, and the editing process was halted during the legal proceedings. He was acquitted after he and co-director Franco Prosperi produced documents proving they had arrived at the scene just before the execution took place. "The Africa of the great explorers, the huge land of hunting and adventure adored by entire generations of children, has disappeared forever. To that age-old Africa, swept away and destroyed by the tremendous speed of progress, we have said farewell. The devastation, the slaughter, the massacres which we assisted belong to a new Africa– one which if it emerges from its ruins to be more modern, more rational, more functional, more conscious- will be unrecognizable. "On the other hand, the world is racing toward better times. The new America rose from the ashes of a few white man, all the redskins, and the bones of millions of buffalo. The new, carved up Africa will rise again upon the tombs of a few white men, millions of black men, and upon the immense graveyards that were once its game reserves. The endeavor is so modern and recent that there is no room to discuss it at the moral level. The purpose of this film is only to bid farewell to the old Africa that is dying and entrust to history the documentation of its agony"
"The old Africa has disappeared. Untouched Jungles, huge herds of game, high adventure, the happy hunting ground- those are the dreams of the past. Today there is a new Africa - modern and ambitious. The old Africa died amidst the massacres and devastations we filmed. But revolutions, even for the better, are seldom pretty. America was built over the bones of thousands of pioneers and revolutionary soldiers, hundreds of thousands of Indians, and millions of Bison. The new Africa emerges over the graves of thousands of whites and Arabs, and millions of blacks, and over the bleak boneyards that once were the game reserves. "What the camera sees, it films pitilessly, without sympathy, without taking sides. Judging is for you to do, later. This film only says farewell to the old Africa, and gives to the world the pictures of its agony." Various cuts of the film have appeared over the years. IMDb lists the total runtime as 140 minutes, and a 'complete' version on YouTube runs closest to that at 138 minutes, 35 seconds. This is an Italian language version, with a clear soundtrack and legible English subtitling. IMDb lists the different runtimes for previously released versions: USA- 122'; Norway- 124'; and Sweden- 116'. An English-language version currently released by Blue Underground runs 128 minutes. 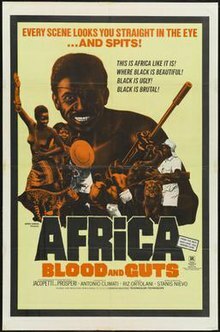 The film was released as Africa Blood and Guts in the USA in 1970, at only 83 minutes (over 45 minutes removed in order to focus exclusively on scenes of carnage); according to the text of the box for the Blue Underground release, directors Jacopetti and Prosperi both disowned this version. An R-rated version runs at 80 minutes. The documentary was written, directed, and edited jointly by Gualtiero Jacopetti and Franco Prosperi and was narrated by Sergio Rossi (not to be confused with the fashion designer of the same name). It was produced by Angelo Rizzoli. The film was also successful in the USA, where John Cohen published a book of the same name. In 1968 at the Carnival of Viareggio, a float inspired by the film took part and made by the master of papier-mâché Il Barzella. Some items from this float, along with other memorabilia including a copy of the book by John Cohen, are kept in Museum of Dizionario del Turismo Cinematografico in Verolengo. "Europe has abandoned her baby," the narrator mourns, "just when it needs her the most." Who has taken over, now that the colonialists have left? The advertising spells it out for us: "Raw, wild, brutal, modern-day savages!" In West Germany, a protest movement against the film emerged after Africa Addio was awarded by the state-controlled movie rating board (Filmbewertungsstelle Wiesbaden). The protest was chiefly organized by the Socialist German Student Union (SDS) and groups of African students. In West Berlin, the distributor resigned from showing the film after a series of demonstrations and damage to cinemas. Today, the protests against Africa Addio are regarded as being the first anti-racist movement in German history. Jacopetti and Prosperi responded to the criticism by defending their intentions. In the 2003 documentary The Godfathers of Mondo, Prosperi argues that the criticism was due to the fact that, "The public was not ready for this kind of truth," and Jacopetti explicitly states that the film “was not a justification of colonialism, but a condemnation for leaving the continent in a miserable condition.” The subsequent film collaboration between the two men, Addio Zio Tom, explored the horrors of American racial slavery and was intended (in part) to combat the charges of racism leveled against them following the release of Africa Addio (though it too was criticized for perceived racism, particularly by Ebert). A soundtrack of the music used in the film was later released. The composer was Riz Ortolani (who had scored Mondo Cane that featured the tune later used for the hit single More). When making Africa Addio, lyrics were added to Ortolani's title theme, making a song called "Who Can Say?" that was sung by Jimmy Roselli. The song did not appear in the film, but (unlike the successful song More spawned by Mondo Cane) did appear on the United Artists Records soundtrack album. ^ Plekhanov, Sergeĭ. A Reformer on the Throne: Sultan Qaboos Bin Said Al Said. Trident Press Ltd. p. 91. ISBN 1-900724-70-7. ^ See the interview with Jacopetti, reprinted Amok Journal: Sensurround Edition, edited by S. Swezey (Los Angeles: AMOK, 1995), pp. 140-171. ^ Niels Seibert: Vergessene Proteste. Internationalismus und Antirassismus 1964–1983. Berlin, 2008. Stefano Loparco, 'Gualtiero Jacopetti - Graffi sul mondo', Il Foglio Letterario, 2014 - ISBN 9788876064760 (The book contains unpublished documents and the testimonies of Carlo Gregoretti, Franco Prosperi, Riz Ortolani, Katyna Ranieri, Giampaolo Lomi, Pietro Cavara e Gigi Oliviero). This page was last edited on 27 January 2019, at 02:15 (UTC).